This book is an excellent resource for young children who have a family member with cancer. I loved the fact that it helps children to process the changes in their life and to express their feelings. It comes with 5 twist up crayons attached. What a great idea! This means a child who is accompanying an adult who is undergoing treatment, has something to do whilst they wait. Highly recommended! 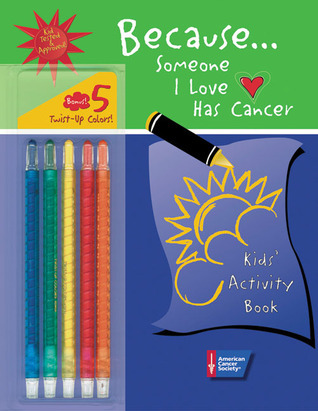 This activity book by the American Cancer Society is filled with kid-focused pages: coupons to give to the special person who has cancer, page for "My Questions," before-and-after drawings, pages to draw feelings, etc. It would be a good book for an individual child or to make reproducibles from for a class of kids who's dealing with a classmate or teacher who has cancer.